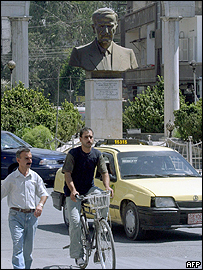 When Syria's old ruler Hafez al-Assad died in 2000 most western leaders stayed away from his funeral. The United States, after all, blames Syria for harbouring terrorist groups, and for failing to disclose stockpiles of weapons of mass destruction. But not French President Jacques Chirac. He went to the funeral rites of the dead potentate. It is said that, that day, the French president told the young son and heir, Bashar al-Assad: "I extended the hand of friendship to your father, and I extend it to you today." France has been present in what used to be known as the Levant for a millennium. The landscape of Syria is dotted with the magnificent fortified castles that the Crusaders - the founders of the medieval Frankish kingdoms - left behind. France was the mandatory power in Syria after the collapse of the Ottoman Empire, from 1918-1946. I went to Syria because I am interested in France; in what France stands for in the Arab world. We all know what the Americans believe: they believe you can introduce democracy to an Arab country by invading it. That is the great experiment in the Gulf region, and Iraq is its laboratory. Washington has given up on Bashar al-Assad - the Accountability Act makes it illegal for American businesses to do business in Syria. France believes in him. Paris believes that the new president is not like his father. France believes Bashar wants change. And France wants to try to help him. French aid to Syria is not financial. It is human. High level teams of French experts are seconded to Damascus to advise on restructuring of the state. Syria is in a state of chronic paralysis. Its economy - part Soviet, part Chinese in its inspiration - cannot create the wealth needed to absorb the new generations coming onto the job market. In a world in which unemployed and despairing young men turn to radical Islam for their inspiration, the need for reform is urgent. But is it enough? Will it work? Syria - despite France's involvement - remains a dictatorship. It is still a security state. Its economy is still controlled by powerful, monopolistic vested interests which can be expected to resist moves to make Syria a more open, competitive and investment friendly place. And if - as France believes - President Assad is interested in change, why, four years after he came to power, does Syria remain manifestly unchanged? It is part of the Gaullist world view that France has a special role in the world, even a destiny; a duty to stand for certain ideals. France wraps its activities in the Arab world in the language of Gaullism. But it is also part of the condition of 21st Century France that it cannot match its lofty rhetoric - its lofty sense of itself - with real action, or real achievement. Self-evidently, France could not stop the Anglo-American juggernaut in Iraq. Self-evidently, four decades of French support for the Palestinian cause has not advanced the cause of Palestinian statehood. Self-evidently, France's efforts to bring Syria in from the cold have done nothing - as yet - to change the reality of the Syrian regime. In a world defined by overwhelming American might, France can take a stand, knowing that in the end it will not be judged by its ability to turn rhetoric into action. It is enough to stand up to America; no-one expects France to be able to stop America. And France, confronted by its own powerlessness, cannot resist taking solace in the misfortune of its mighty Anglo-Saxon rival. I came to Syria because I was interested in France. Because while France was saying "no" to America and Britain, no to the imposition of democracy by military force, I wanted to understand what it was the French were saying "yes" to. And the difference is the difference between idealism and pragmatism. America wants to topple anti-western dictators; France wants to work with them in the hope that they will become less anti-western. America believes it can introduce democracy to the Arab world; France is pleased when it manages to introduce ATMs to its banking system. Each - in separate ways - is trying to re-shape the Arab world in its own image - and bend the Arab world to its own needs. The Arab world - you sense - has different plans altogether. 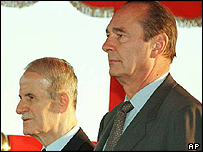 Chirac's New Backyard, presented by Allan Little, is broadcast on BBC Radio 4 on 7 September, 2004 at 2000 BST.